As a resident of Metro Detroit, one of the benefits to many has always been our relatively close proximity to the Cedar Point amusement park. Cedar Point has always, for most of my life, been known as one of the top places in the world for roller coaster enthusiasts. I’ve always had sort of a love-hate relationship with roller coasters. I’ve always loved them but they didn’t love me so much. While growing up, my best friend lived two doors away from me. We were inseparable (we are still best friends, though we live about an hour apart) and one of the things I looked forward to every year was going to Cedar Point. His mom always took him as part of a group of families who went, all centered around a hair salon that she had once worked at. There were a lot of kids around the same age, and since his older sister didn’t usually want to go, we always managed so that I could tag along. actually loved these trips because it was a couple of days with my best friend. And, at a roller coaster park! We’d always stay overnight so on top of it there was the hotel pool, and once we hit puberty, there was the ‘developing’ girl that was part of one of the other families. Yeah for adolescence. I loved going to the park and loved riding the rides. I’ll never forget going the year (1989) they opened the Magnum, which at the time was the tallest roller coaster in the world. At 200 feet, this was like nothing else ever seen. We waited in line for probably three hours to ride this, staring in awe at the then-giant hill. It’s one of the last truly great chain-pulled roller coasters, meaning that once we got on, that click-click-click during the ten minutes (or so it seemed) of climbing that hill gave true meaning to the term anticipation. They topped that height mark easily with some of the other coasters and rides they put in. Millennium Force hit the mark right around (you guessed it) the new millennium, topping out at around 300’. To get that high, they couldn’t use chains and you go up the hill a lot faster (without the clicks). The upside is that it’s a much smoother ride. Top Thrill Dragster hit a few years ago, and was a ‘launch’ roller coaster that went up over 400’. We were in our 30’s then but driving into the parking lot and seeing this thing was a sight to behold. It launches you at over 90MPH within three seconds, pushing you up the hill and straight down the other side. 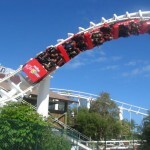 There have been others, and for a long time they had the distinction of having the most roller coasters of any park. 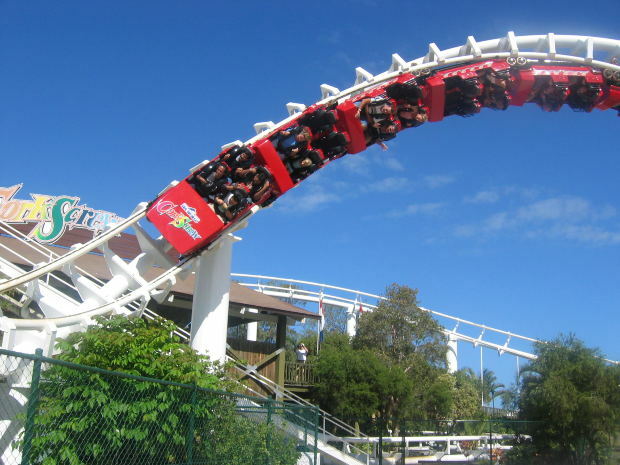 They’ve since taken a few older ones down, so they are now second or third on the list, but it’s still a great place for roller coaster lovers. As I said, I have a love-hate relationship with them. The problem I always ran into is that I would inevitably get sick. I am self-diagnosing here but I used to have a ton of inner ear infections when I was a kid, and I think that I have issues with my balance and such, which roller coaster riding always got me. I’d be fine with the first one or two, start getting nauseated as the day went on, and as much as I loved the roller coasters, I was always forced to stop riding them earlier in the day than the group I was with. (One of the most embarrassing moments of my life was when I got pushed into riding ‘just one more’ and threw up while the ride was still in motion. I still blame my aforementioned best friend; I was not enjoying the ride but felt I would have made it to the end until he looked at me and announced as loud as he could ‘He’s Going To Be Sick!’ At which point I was. Those poor, poor people behind me). For some reason, I never thought to use motion sickness medicine until I was in my 20’s. I tried out some Dramamine and it worked. Like a charm. By then, the trips were less frequent, but they were a lot more fun. We hadn’t gone in a while, so when an opportunity presented itself last Saturday (which also happened to be our wedding anniversary), Mrs. Beagle and I took it. I’d read that it was a lightly attended day, as many people waited for ‘Hallo Weekends’ which started the following weekend . We didn’t think we were going to make it due to some rain, but it cleared out before the morning, so we headed out. And we weren’t disappointed as the weather was beautiful. Cooler with partly cloudy skies. We stopped to eat and like clockwork, I took my Dramamine a way before entering the park as was my new tradition. Sure enough, predictions were true and the place was the least busy I’ve ever seen it. We knew how not busy it was when we got right onto Millennium Force, waiting less than fifteen minutes. This has always been one of my favorite rides and even though it’s over ten years old, is still ranked one of the best in the country, which usually means long lines regardless of when you go. So we went. Because it’s not chain driven, it’s always been very smooth, not getting bumpy as many steel coasters did when they were chain driven. I commented to Mrs. Beagle that it was a heck of a way to start the day. Usually, with the park busy, we would start off on some of the smaller roller coasters, but didn’t need to today. We rode the ride and it was definitely fun. Definitely fast. Definitely a heck of a way to start the day. Next we went on Maverick. This opened five years ago, the last time we were actually there. With it being brand new then and there always being kinks it’s first year, it was shut down the entire day in 2007 so we never made it on. The only thing I knew about it is that it has a drop that is over 90 degrees, meaning you’re not just going straight down but actually more of an angle. Sounded cool to me. What I didn’t know is that the other defining fact was that the rest of the ride was twist and turns. Lots of them. Very smooth twists and turns but many twists and turns just the same. My wife loved it but I came away definitely feeling it. I figured all the twists and turns were hitting me harder than I thought. I took a second Dramamine, figuring that it would combat what I had. Next we went to Top Thrill Dragster. After all, with the park not busy, why not hit the three most popular roller coasters right off the bat? And, though I was feeling a little bit of motion sickness, I figured the second Dramamine, plus the fact that this didn’t do any real twisting or turning to speak of (it shoots you straight up and then comes straight back down…the entire thing lasts about 20 seconds), it couldn’t give me any motion sickness effects. I came off feeling a bit sick. Which was surprising because having ridden it many times over the years, this never happened. It couldn’t. We walked around for a bit, went on the antique cars and such, and decided to go on one of the really easy roller coasters, the Iron Dragon. I figured the 45 minutes or so that I’d taken would help ‘clear my head’. This seemed fine until the ride started and I instantly realized that, although it was easy, the ride swung from side to side. This didn’t do me good at all. After fifteen seconds, I just wanted it to be over. I knew I wasn’t going to give a repeat performance of my previously mentioned embarrassment, but I knew I was lucky we hadn’t picked a longer ride! When I got off the ride, my wife thought I would get sick right there on the spot. I didn’t. We walked over to a bench where I sat down. It was touch and go, and I almost walked into a nearby bathroom, but managed to keep everything down. Even so, I knew I was done for the day. I was disappointed and Mrs. Beagle was disappointed. For some reason, the Dramamine had failed me. Come to find out, as you get older, your inner ears aren’t as strong as they were. Since mine weren’t great to begin with, I guess the five years since I’d last been had taken their toll. We ended up leaving the park after another hour. Four short roller coaster rides in and my day was done. When I still felt sick the next day, I knew that I had to call it quits. For good. That was the first Sunday of NFL football, and I was forced to watch my beloved Lions huddled on a couch, dozing fitfully, finally rousing at the end long enough to cheer them on as they eeked out a win. No more roller coasters for me. I’ve read stories where people had long lasting effects from roller coasters, and I don’t want that to be me. The second day after, I felt fine. But to feel that way for over 24 hours after, that’s not a good feeling. Even when I was a kid and would get feeling sick at the end of the day, I’d be fine as soon as we left the park and hit the hotel pool. To feel sick over 24 hours later tells me that my body is telling me something. And trust me, I’m going to listen. I’m done. It’s been fun, roller coasters, but it’s time I move on. I’m sure you’ve got action and thrills and fun for many more people, but sadly, I will not be one of them. Do you love or hate roller coasters? If you’ve called it quits, what led you to stop riding? What’s your favorite coaster?